Martha Graham once said in a very succinct and apt way, “Dance is the hidden language of the soul.” Every nation in the world has some form of music and dance as integral parts of their history. However, perhaps no form of dance can enable the soul to speak more eloquently than Latin dance. The sheer energy, frame, grace, power, sexiness and charisma of this dance form, decades ago, took the world by storm and still holds it in-thrall. There are dozens and dozens of dance forms that come under the umbrella of Latin dance so we thought (with it being Strictly season) that we’d take a closer look at five extremely popular Latin dance forms. Even the name of the dance, Cha Cha Cha, can get the feet a-tapping! This dance originates from Cuba and has its origins around 1952-53. Technically speaking, the dance movements for the Cha Cha Cha start on the second beat and it also had a split fourth beat. Traditionally, this dance is accompanied by good old Cuban music or Latin rock. There are a few variations from country to country as well. The Samba originated in Brazil in the early 20th century, with a few of its steps first detailed in the early 1910s. This is a partner dance, which is lively and very energetic. 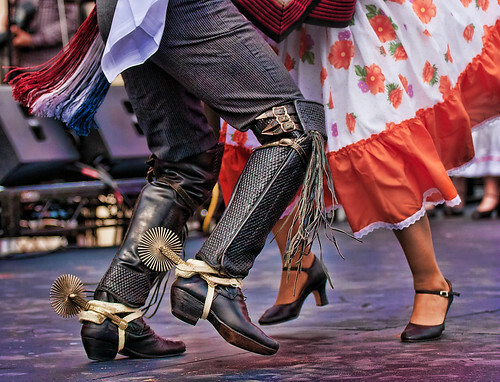 The technique behind the Samba involves the bending of the knees, which causes the couple to have a bobbing action. One dance form that shows the marriage of two different cultures is the Rumba. It has a distinct mix of Cuban and African influences and has a ballroom version. The ballroom version of the Rumba is to a slower beat and even restrained compared to the Afro-Cuban Rumba. One of the signature moves of the Rumba is the hip sway, which takes place when a dancer is balanced on just a foot! This Spanish term stands for double step and that is the core of this Latin dance form. It is performed by a duo and is a very lively style of dance. Interestingly enough, it has close links to the Spanish tradition of bullfighting. It is a very structured dance form and, as a result, it is mostly performed at competitive levels. Even though there is some debate about whether this is a true Latin dance form or not, the Argentine Tango is considered by many to be inextricably linked to the history of Latin dance. This is probably one of the slower dance forms among the several Latin dance forms and is marked by a couple dancing in close embrace to nostalgic music. This article was produced by leading Latin America Tour operator – Journey Latin America who offer superb holidays to Argentina, Brazil, Peru and the whole of the South American continent.